Thinking I’d expand my gluten free recipe repertoire, I impulsively purchased a box of “multi-purpose” gluten free flour. Since then I’ve used it in only one recipe — these gluten free fudge brownies. 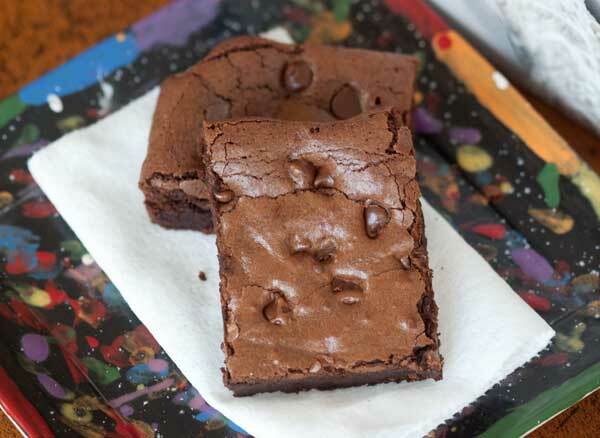 If I never make one more thing with the special flour other than these brownies, it will have been worth it. They are my new favorite gluten free brownies. This recipe is based on one of my old gluten free brownies recipes which calls for unsweetened chocolate. Because I didn’t have enough unsweetened chocolate to make the recipe the usual way, I used a mixture of unsweetened chocolate, cocoa powder and chocolate chips. Another improvement was to whip the eggs and sugar. I’ve been baking tons of different brownie recipes lately and the recipes made with whipped eggs and sugar almost always have the best texture. Also, since the brownies lack gluten I suspect the whipped egg and sugar mixture gives them some support and improves the texture. They’re fudgy and light at the same time, yet still sturdy. I hope you try the recipe. If you do, let me know what you think! I think my next experimental brownies will be paleo. I’ve seen a lot of good ones that use coconut flour, almond flour and honey. Gluten free flour plus a mixture of whipped eggs and sugar help keep the texture both light and fudgy at the same time. Makes sure to use a really good cocoa powder. I haven't tested with natural yet. So far I've only made these with Rodelle brand. For the chips I've tested with Guittard semisweet and Nestle's new "dark" chips. Preheat oven to 350 degrees F. Line the inside of an 8 inch square metal pan with nonstick foil. Melt the butter in a saucepan set over medium heat. When it is about halfway melted, add the chocolate and reduce heat to low. Stir until chocolate melts, then stir in the cocoa powder and 1 oz of chocolate chips. Stir in only 1/2 cup of the sugar, then remove from heat. Put the eggs in the bowl of a stand mixer and beat with the whisk attachment for about a minute. With mixer going, add remaining 1/2 cup sugar and continue beating for about 5 minutes or until mixture is pale and thick and falls off the whisk attachment in ribbons. Beat in the salt and vanilla. Fold about 1/3 cup of the egg mixture into the warm chocolate mixture, then fold the chocolate mixture back into the bowl with the egg mixture. Stir in the gluten free flour. Spread batter in pan and sprinkle chocolate chips on top. Bake for 25-27 minutes or until top appears set. Remove from oven and let cool completely. Lift from pan and cut into squares. I've also made these with Bob's Red Mill All-Purpose Gluten Free Blend. That flour is a little fluffier and requires about 1/3 cup plus 3 tablespoons to make the requisite 2.1 oz. If you are measuring by volume, stir the flour and measure as you would regular flour. These look delicious gluten free or not! I’ll have to “cheat” and make these with my organic cane sugar (most like regular granulated, I don’t use it often). They look great! Thanks Sonya! I’ll check it out. Yum!!! BTW, if anyone needs a reference for a friend or family who is sensitive to gluten AND sugar, I found the Cookbook Delightfully Free by Tracy (I forget her last name) and my friend loves her recipes! Amy, did you happen to see this one? It’s a flourless chocolate cake made with coconut flour. Our whole family really, really loved it. Today is my last day of Whole 30. I have a bag of coconut flour so I’ll look forward to that brownie recipe. But I will make this one too! I did search your blog last night for coconut flour recipes and found the chocolate cookies. You always have what I’m looking for!